Many people have tight muscles due to working out without a stretch routine, sitting a lot, age and a variety of other reasons. Developing a good stretch routine through daily practice is very important! Just a few of the possible benefits are relief of stress, stiffness, improvement of sleeping patterns, and improvement in athletic performance. These sessions are personalized for your specific areas that need attention. A routine is developed for you that should be practiced everyday. Additionally, during the actual session, assisted stretches are performed by Monica to help increase your range of motion. This is done with a gentle warm up along with some dynamic stretches. 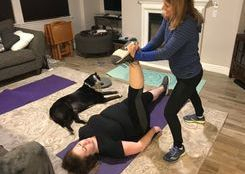 Then, the client is instructed on breath, and relaxation while performing both stretches on their own, partner stretches and practitioner assisted stretches. Each session takes approximately 50-55 minutes. price is $95 and includes follow up calls or emails for one month. For ongoing sessions, please see the Rates and Services tab above. Rates are the same as regular training session packages either monthly or bulk rates.